The grapes for our wines are produced from our proprietary vineyard, located in Thracian plain. The compulsory “green pruning” is utilized in order to reduce the yield to the required quantities. The physical and chemical properties of the grape fruits and the soil are constantly monitored. The grape clusters are gathered by hand and are placed in small crates. Then the crates are sent to the cellar, where the clusters are sorted and processed. After the shelling and cooling of the grape mess, it is sent to inox vessels for cold maceration, which takes several days. Then the grape mash is warmed up and sowed with pure culture of wine yeast in order to implement controlled alcoholic fermentation. The wine is separated from the marc and is sent, for the process of quiet fermentation. Then the wine is racked and left for maturation in oak barrels, Baric type for the RESERVE wines. After spending between 12 to 18 months in the barrels, the wine is bottled and is left to mature for couple of more months in the bottles. For the people who like fresh, fruity wines, we do wine processing and bottling without oak barrel contact, but the maturation process in the bottles is compulsory. 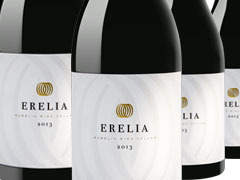 The wine of the “ERELIA” series is cellar’s top class wine and it combines the advantages of four grape varieties – Syrah, Cabernet Sauvignon, Merlot and Mavrud. 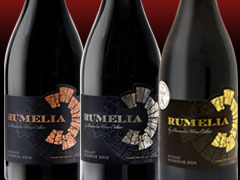 The wine of the “RUMELIA” series is Cellar’s top class wine. The aroma is intensive, the taste is tight and the body is rich with pleasant tannins and sweetness. The wines of “MERUL” series are distinguished by their extraordinary style and distinct character. The wines of “MERUL RESERVE” series are source of inspiration and each bottle carries the breath of pleasant moments and strong emotions. Fresh and delicate wine, intended to be consumed young.